Kpop: Transmedia Marketing Like You’ve Never Seen Before. South Korea is the pinnacle achievement of multi-media internet communications in the modern world. Nearly all communication in South Korea is almost entirely dependent on the digital world and as broadband has developed, newer forms of communications are beginning to dominate. Even as a country with a comparatively small population, South Korea boasts the second largest number of bloggers in the world. That number is surpassed only by the United States (Choi). Mobile phone usage to access blogging platforms, social networking sites, and multi-media sharing sites in South Korea surpasses nearly every other country on earth. According to a global study by the Financial Times nearly three-quarters of the total South Korean population is heavily reliant on mobile phones and multi-media communication as a part of daily life, surpassing Western Europe, the United States, and even Japan (Katz). That number has only continued to grow dramatically in recent years and covers both Korea’s cities and its rural countryside. The current reality of the situation is that South Korea is a fully wired world, the State’s citizenry is continually bombarded with digital media. This flood of media extends through pictures, music, blog posts of rants and manifestos, videos and video games, and it bleeds into the real world in the form of trends in everything from fashion to political opinions. The wired world phenomenon has created a new structure of interpersonal relationships that blurs the line between the virtual and the physical (Choi). Such an overwhelming mix of cyberspace and the world’s physical reality has become the norm and it means that typical advertising schemes are proving to be much less effective than they were when a singular ad at the bus-stop was the only thing people waiting for the bus had to look at. 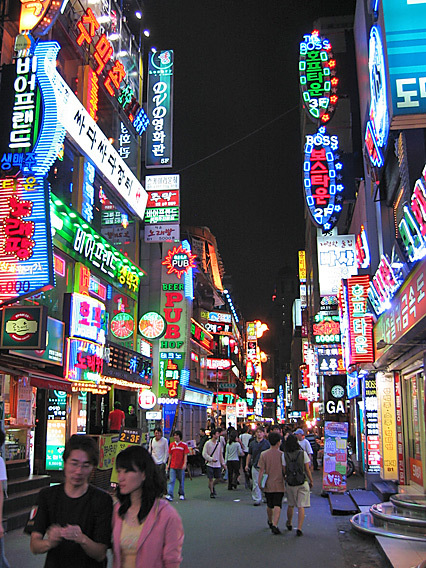 For many of South Korea’s industries, this has posed a serious problem. Adapting to the sudden demand of the market that a productbe everywhere at once, all over the internet, has been difficult for the slower-moving companies, especially the ones like grocery stores that had never before needed to advertise. Now, nearly every industry is clinging to the one industry tht boomed under the new pressure: Kpop. of fluid media contends that any given text will naturally flow between mediums because of the audience’s use for various aspects: photos end up on CyWorld, Me2Day, Instagram; videos on Naver, YouTube, DailyMotion; Radio edits, audio track in-house performances, and interview recordings and even endorsements end up Soompi, Mwave, Gaon, or Hanteo. All of these aspects are usually pulled from the very same footage, which is dissected by the audience and spread between platforms as audience-use demands of it. (The picture below is a screen cap from a film-broadcast of a radio show recording). Fluid media ensures that said narrative or event within a narrative is widely known very quickly, and it also allows for a steady stream of new information related to the original event to be released so that a given topic is omnipresent without simply being repeated ad nauseum. Indeed, according to the Korean exchange students currently I live with, the very term ‘ubquitous’ has a connotative spin to it that layers in a sense of universal digital presence as well as continual updates, invoking the idea that something new is always happening. Kpop stars are treated like actors in an elaborate and far-reaching fiction. For the duration of their pop-star careers (8-10 years on average for successful groups), every move they make is counted as a new development in their story. And the stories they generate ‘outside’ of their promotional cycles often make it into their actual promotional videos. (For example, in the picture to the left: the girls of SNSD interact on Radio Star in a certain way, the bandmates that they’re most friendly with here might end up being their allies in a spy-drama music video next week). Promotional Photo for a 20-minute long Cass Commercial Film Mini-Drama, starring Nickhun and TaecYeon of 2PM and the actress Yoon EunHye. Kpop, especially the Idol-based side of it, is a music industry only in the most basic sense of the idea. Music might be the focus of the big music companies, but it is not the main product they unleash upon the world. The true products of Kpop music companies are the bands themselves. The music these bands create is fantastic on its own, but music is hardly the only media these bands participate in, even in regards to musical releases. From teaser pics and BTS footage surrounding the music videos, to the catchy choreography and heart wrenching stories within them, even the musical releases of these music companies appeal to audiences through multiple media platforms. Kpop blurs the line between advertisements and products by making the commercial nearly as coveted and impressive as the product itself. Every single release in Kpop has some sort of story-basis stemming from a broad thematic idea boiled down into a concise, if sometimes quirky, concept. This even applies to the music videos that do not have an active storyline being played out on the screen. These concepts allow for pervasive multi-media expansion: the fashion sweeps the market, keyed to identify a specific band’s release with brand-name-esque recognition factor. Choreography is also release specific and stylized for individual bands, allowing fans to feel a deep connection to their Idols’ world. Advertisements with QR codes for phones to read continue that sense of interactivity, often leading into storylines that draw in hoards of fans (take the half-hour MBLAQ Chapstick mini-drama, for instance). Kpop Fans show support for their favorite groups. There’s a dramatic connection between the Idols and their fanbases, one that is formalized and meticulously maintained by Kpop companies. Fandoms have specific names, colors, chants, handsigns, styles, and symbols to identify themselves with. (No, really: TVXQ has Cassiopeia, Infinite has Inspirits, T-ara has Queens; SuJu’s ELF fan-color is Sapphire Blue; SHINee’s Shawols have some of the clearest fanchants in the game, BagBang has light-stick crowns… this list is really endless). Fans take their roles incredibly seriously and are actively responsible for the success or failure of kpop groups. Branching out along transmedia lines, Idols and Indie Artists alike promote themselves with personal pictures and short textual messages via social media sites such as Cyworld, Me2Day, Naver, and Twitter; musicians also serve as models, radio hosts, broadcast MCs, and guests on variety shows. They act in stage dramas, TV shows, and commercial films, and they sing OSTs for all of the above. Idols, and many of the more popular Indie acts, are presented through so many different media outlets, simultaneously, that they become continual presences in the everyday lives of the South Korean citizenry. The people themselves are the product, being perpetuated virally though the digital culture fostered in the modern era. Indie or Idol, Kpop groups just play by a different set of rules. Indie Kpop plays the numbers game with slightly different rules due to tighter budgets, with a marketing system that is less flashy and pervasive than Idol Kpop, but even so many of the transmedia elements of Idol marketing are represented in the Indie market as well. The Indie artists often get invited to participate in OSTs or to go on variety shows. Sometimes it’s difficult to tell if a band is truly Indie or not because of their participation in the same music and variety shows as Idols, their collaborations with Idols, and their use of transmedia marketing schemes similar to Idols. Indie bands are more directly focused on the music aspect of their work, but the band members still make appearances in various other types of media, such as radio broadcasts and endorsement photos, to promote themselves and their music. Simply listing out the overwhelming number of things that South Korean musicians participate in belies the complexity of the system behind their omnipresence, as well as the quality of their music. Kpop Idols are not just musicians, but their music is on par with the best of any industry. These ubiquitous musicians aren’t just simply everywhere at once, rather they use the overlap of media to be everywhere relevant at once. News spread from nexus serves like Naver or Arirang and spreads endlessly without much in the way of formal marketing moving the process along. Sessions spent as radio station hosts are filmed, and the videos of the musicians’ in-station antics are posted after the live broadcast to quite literally add a secondary dimension. The media platforms the recordings are posted on allow for seamless sharing, so that any worthy moment can be screen-capped and gif-ed and spread through cyberspace on yet more sharing platforms to make the occurrence common knowledge and the musician a household name. There are similar processes in the West with the emergence of platforms such as Tumblr and Reddit, but in South Korea the extent to which media is diffused and the speed with which it spreads from platform to platform, crossing media lines as it does, is unrivaled by anywhere else in the world (Choi). 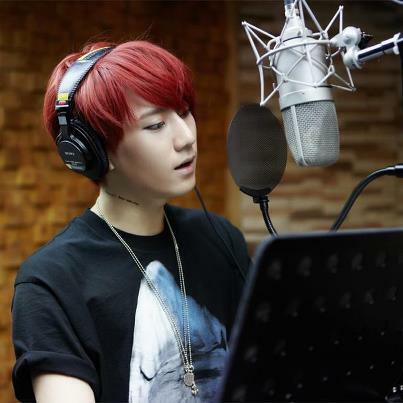 HyungSeung (of Beast) recording for ‘Mozart’ OST. Kpop is not simply an Idol industry that pimps out crazy-cool stars like Psy and hopes blindly to make a media storm. Kpop is extraordinarily careful in how it targets specific demographics, weaving through a mix of niche genres and styles to appeal to a wide swath of the population. Gangnam Style was ridiculously funny; it also had social commentary. Fantastic Baby is a political statement, and also catchy as hell and full of freaky fashion. In short, Kpop is not at all what it first seems to be, it’s incredibly multifaceted, and it’s pervasive in ways that only an industry born and raised with the internet can be. The video below is a compilation FMV of 31 of 2013’s best Kpop MVs, all of which were marketed to vastly different consumer demographics and all of which are entirely different that the average American’s perception of what Kpop is. For an even more detailed and technical breakdown of the Kpop Industry, as explained in a short documentary film, click here. Choi, Jaz Hee-jeong (2006) Living in Cyworld: Contextualising Cy-Ties in South Korea. In Bruns, Axel & Jacobs, Joanne (Eds. )Uses of Blogs. Peter Lang, New York, pp. 173-186. Katz, James E., and Mark Aakhus. Perpetual Contact: Mobile Communication, Private Talk, Public Performance. Cambridge University Press, 2002. Print. No Copyright Infringement Intended: All media blogs to its respective owners. “Copyright Disclaimer Under Section 107 of the Copyright Act 1976, allowance is made for “fair use” for purposes such as criticism, comment, news reporting, teaching, scholarship, and research. Fair use is a use permitted by copyright statute that might otherwise be infringing. Non-profit, educational or personal use tips the balance in favor of fair use”. Images obtained from Creative Commons Google Images Interface with allowances for posting that contributes to discourse.